Both times, perhaps because of how young I was, I never felt that I got to know the city of San Francisco itself. So over a period of four days, I've decided to really explore the windy city and its surrounding areas, including Yosemite National Park and Napa Valley. My first day began with a trip to the Mission District, somewhat comparable to Brooklyn in New York. Vivacious, hip, and somewhat shady in the wrong areas, today its inhabited by SF's youth and homeless alike. Dolores Park is a favorite hangout for nearly everyone that resides in the area, and all over town. On a sunny day, one can find picnics and drug deals (presumably, and recently legalized for certain substances) going down on this hilly park. 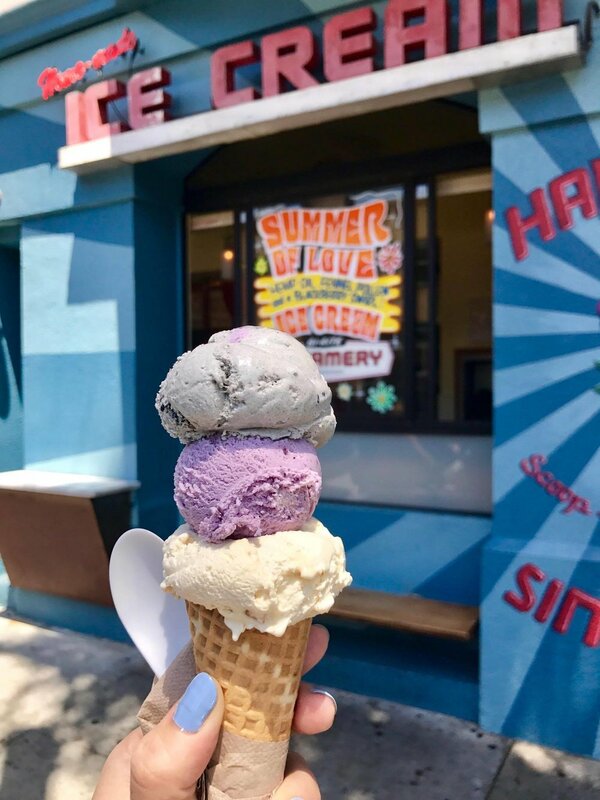 Arguably a San Franciscan institution, Bi-Rite Creamery at the north-east corner of the park has been serving up ice-cream cones to locals since the 1940s. The featured flavor this month was black sesame (how did they know it was my favorite flavor?? ), top scoop seen here. As with most things in California, it is organic, home-made, all-natural, gluten & soy & diary free...just kidding, its only the first two. But still, delicious. From here, Fisherman's Wharf is just a short walk away, down the hill. A very commercial area, its usually packed with tourists but has a decent beach and some...ships. Was the fish and chips worth the 30 minute wait? Not in particular, seeing as how I hail from another city in the north that makes very decent iterations of the same dish, but the fried oreos? Oh yeah. High on fried food, I head to Crissy Field for a view of the Golden Gate. A few steps down is another beach, pretty, but in true San Franciscan fashion, very windy. A higher view of the Golden Gate as I head upwards towards Fort Point, and the Golden Gate Welcome Center, the entrance to the bridge on the SF side for pedestrians. San Francisco has the largest and oldest Chinatown in the country. The famous Dragon's Gate marks the entrance this Chinatown. Inside is what you'd typically find at any other, a good destination for dim sum and Chinese food if you're in the mood. One last arts and culture stop for the day, the SF Moma. During the time I went, they featured a special exhibit on Edvard Munch, though The Scream was not on display at the time, however. A very worthy stop for any lovers of modern art, I found the museum's architecture as well as design as compelling as the priceless pieces it housed. Day 2 started with a hearty breakfast at Sear's FIne Foods, best known in the city for their Swedish pancakes. As an avid avoider of carbs for caloric reasons, even I had to say that when drenched in syrup and slathered with some butter, these were pretty good indeed. In the spirit of full disclosure, my first choice for breakfast this morning was a local institution known simply as Mama's. 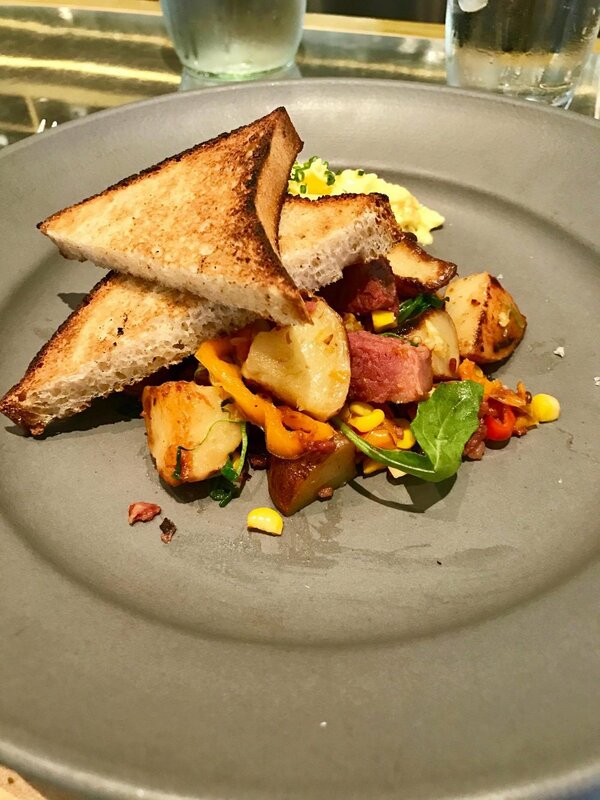 Described by a local as the Eiffel Tower of San Franciscan breakfasts, I arrived at 7:40AM prior to the restaurant's opening at 8 to find this line, already a good half hour or longer. Needless to say, I did not have the patience to wait at this Eiffel Tower of breakfasts. Another trip, then. I'm not typically a breakfast person, but on this particular morning some carbs were called for to line the stomach for a day of one of my favorite festivities...you guessed it, drinking. Well, wine tasting, to be exact. Approximately an hour away from the city are the rolling hills of Napa and Sonoma Valley. These gentle slopes produce some of the most prized wine of the country, and the world. Nearly every winery here is open during the day time for wine tasting. Some of the wineries here have been in the same family for generations. Aside from the main attraction of, well, wine, many wineries also feature spectacular grounds that make it a worthy visit in of itself. Many wineries offer tours of their facilities and grounds in addition to the tasting. Though they may not let you taste straight from the barrel as one does in South Africa (see my wine tasting trip to Stellenbosch: here), it can still be quite informative at times. 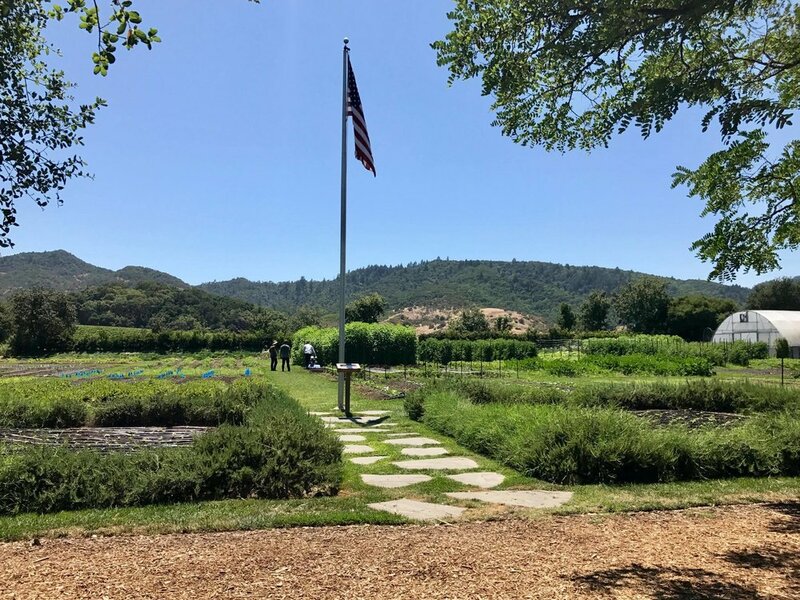 In case the flights have gotten to your head after a couple of stops, stop for lunch at the picturesque town of Yountville, perhaps best known as the location of the French Laundry, a three-Michelin star eatery by Thomas Keller. I didn't snag a coveted reservation in time for this trip, but did stop for some food at Ad Hoc, also by Keller. If the food at this casual restaurant by Keller is any indication of the quality of the French Laundry, I will literally fly back once I land a reservation (currently, they're booking 6 months in advance...) Abosolutely delciouis. So maybe I didn't get to eat here this time, but at least I got to walk by, and...snap some photos? After wandering away from a mediocre winery, I happened upon Prager Winery and Port Works. Why the cash on the wall, you ask? The owner nonchalantly explains to curious observers that one day people just started to put the bills up, and it just continued from there. All in all, a great day spent amongst the Sonoma and Napa Valleys. Wineries of note that I missed out on include the Chandon winery in Napa, of Moët and Chandon, of which you have to make a reservation in advance for certain tastings. Though its unorthodox to only spend a day in Yosemite (it's a 4 hour drive from San Francisco), I felt that my day in the national park was semi-sufficient to see many of the sights this staggering place had to offer. There was a wildfire here a few years ago, some of the damage can still be seen. One of our first stops was Sequoia Grove. Though its a little bit of a hike to see the sequoias, and a big more of a hike coming back up the valley, its worth it to see these monstrous trees rising amongst their counterparts. (Note: random lady in photo). Fun fact: giant sequoia's are the world's largest individual trees, and the world's largest organism by volume. They can grow to an average of 50-85 meters (165-280ft). This one's somewhat hidden amongst the other smaller trees. Worth a visit if one is in Yosemite even though its a bit of a hike to the grove. Don't miss the remaining tree hole on the right, remenants of what was presumably a large sequoia. Tunnel View is the one stop all visitors to Yosemite will make. This view from this scenic outpost is the picture typically found in many brochures and photos of the national park. From here, you can see Upper Falls in the distance, and Half Dome in the distance. The Valley Floor is a good place to stop for lunch. Not only is it a great view to the Upper Falls, be sure to hike the short route to Lower Falls (not pictured here). Though Upper Falls is also accessible, its a much more strenuous 2-3 hour hike away. Lower Falls, seen here in the lower part of the photo, is a much more leisurely stroll away. Climb on the rocks for a closer view of the pouring rapids, but be careful of the slippery rocks and splashing water, especially as one ventures closer and closer to the source. Nearby there is a river and some choice rocks to lounge upon, if one is in the mood. Also a great view of the mountains in the distance. Stop here for some tanning to soak up the majestic aura of the park. Stop by the Swinging Bridge on the Valley Floor for a view of Half Dome, the indented crater shaped mountain in the distance seen from many places in Yosemite. Though Half Dome village exists and is very proximate to its namesake mountain, I didn't have time to make a stop there on this trip. Another majestic mountain range seen here from the valley. Half Dome to the left as seen here. Views of the famed rock formation is ubiquituous everywhere in the park, it seems. A few more shots of Upper Falls, seen in the distance. I'm not certain, but this is either Bridal Falls or Rainbow Falls. A snapshot of the valley on the drive out of Yosemite. Though there was a large wildfire here a few years ago that destroyed hundreds of acres of trees, Yosemite is still quite unparalleled for its natural scenery in the state of California. Definitely a must if you're in the area, even San Francisco was a cool four hour drive away. A worthy journey. My last day in SF was relatively less busy across the board. Looking for a late breakfast/early lunch, I wandered around the historic Ferry Building that's now a marketplace with many food vendors. Unable to leave SF without my fair share of imbibing on oysters and having no luck at Swan Oyster Depot, I tried my luck at Hog Island Oyster Co. instead. Located in the back of the Ferry Building Marketplace, this was the line at 11AM, just a couple of minutes after they opened. Though the line seems slightly dauting here, due to the size of the place it actually moved very quickly. As its name suggests, the restaurant has a oyster bar, where these tiny morsels of goodness are freshly shucked on heaps of ice in front of on looking and eager patrons. The cocktail below was stronger than expected, as I'd been warned by the waitress, but probably one of the more interested drinks I've had in my 22 years. (After all, I've only been legally drinking for just over a year...of course). The fried oyster on the right was also crispy yet wonderfully soft on the inside. Grilled shrimp (left), hands down the best I've ever had. Robust flavor in each succulent morsel, grilled to perfection with just a hint of that woody, burnt taste. The sashimi (right) laden with a tangy, spicy dressing, highlighted by the drizzle of olive oil and garnished with fried shallots. Grilled oysters, seasoned to just the right amount of saltiness and sweetness without compromising the taste of the sea. Dip bread in the leftover juice for an unforgettable explosion of flavor in your mouth. Did I mention that in addition to scrumptious food, Hog Island has an amazing view of the bay? Incidentally, the back of the Ferry Building also offers up some gorgeous scenery of the SF waterside on a nice day. Stop by Gott's for some of their famous soft serve. I opted for the swirl because best of both worlds and all. Sutro Baths was one of my last stops in the city. Built in the early 1900s as a large-scale seawater pool, in its heyday it looked incredibly magnificent for something of its time. Due to a fire that destroyed it in the 1940s, today the historic baths stands in ruin. On a cloudy day, it seems slightly ominous, but I'm sure it was a thing of beauty back in its day. Final stop on this trip was the Coit Tower. Never one for the lines, I didn't go up the elevators to the top, where panoramic views of the city-scape await, or so they say. Probably worth a visit on a non-busy and sunny day. And that's it for my trip to San Francisco. A beautiful city that's true to its name, very windy and consistently on the colder side during the summers (though supposedly temperate year-round). It reminded me of my native Vancouver, especially the cloudy skies that can scatter or thicken into rain on a whim. Though there were a couple of places I did not get to experience (read: eat at) due to the throng of people visiting for the holiday weekend, nonetheless the west coast will forever entice me with its proximity to nature and beautiful scenery.